AT&T Inc. T recently announced that it has acquired The Chernin Group’s stake in Otter Media, taking full ownership and ending their four-year-old joint venture, for an undisclosed amount. As a result, Otter Media will be part of AT&T’s WarnerMedia unit, which was formed after the telecom giant closed the buyout of Time Warner in June 2018. AT&T and The Chernin Group established Otter Media in 2014 in order to capitalize on growth of direct-to-consumer subscription. Notably, the transaction will combine Otter Media’s portfolio, including Ellation, Fullscreen, Rooster Teeth and Crunchyroll into the telco’s WarnerMedia business. Otter Media also has ownership stake in global content studio Gunpowder & Sky and Reese Witherspoon’s media firm Hello Sunshine. The strategic move was in the cards once AT&T completed the acquisition of Time Warner and Otter Media appointed AT&T executive Tony Goncalves as its CEO in February. Goncalves will continue to run the company reporting to WarnerMedia CEO, John Stankey. With a comprehensive portfolio in media, distribution and content delivery, full ownership of Otter Media will likely take the business to the next level. Benefiting from the rapid growth in consumption of online videos, Otter Media established a global audience of more than 93 million monthly consumers and is on track to deliver more than 75 billion video views this year. It is one of the top 10 subscription video on demand (SVOD) providers with more than 2 million paying SVOD subscribers. The combination with WarnerMedia will help create a new-era media company to deliver a variety of content to customers. Over the past three months, shares of AT&T have gained 3.1% compared with 8.8% growth for the industry. Therefore, it remains to be seen how such transactions help the company to augment its cash flow in the coming quarters and boost its share price performance. 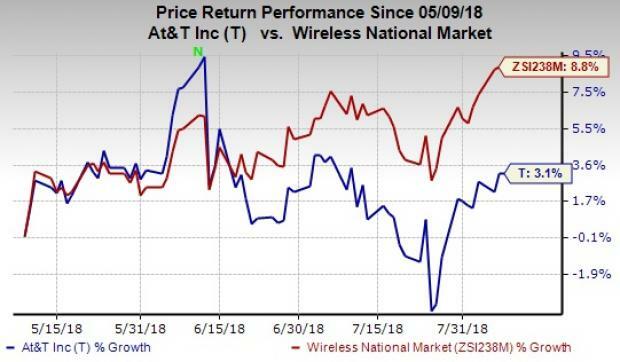 AT&T currently sports a Zacks Rank #1 (Strong Buy). Other top-ranked stocks in the broader industry include Comtech Telecommunications Corp. CMTL, Micron Technology, Inc. MU and Verizon Communications Inc. VZ. While Comtech and Micron sport a Zacks Rank #1, Verizon carries a Zacks Rank #2 (Buy). You can see the complete list of today’s Zacks #1 Rank stocks here. Verizon has a long-term earnings growth expectation of 6.2%. It surpassed earnings estimates twice in the trailing four quarters with an average positive surprise of 2.1%.